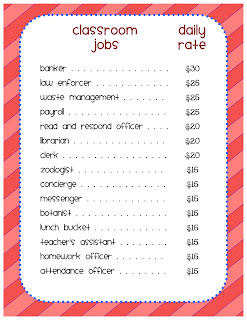 I have been using a classroom economy system in my classroom for 5 years now. Our economy system is check based, I don't use any cash at all. Students keep a balanced checkbook register and I have bankers keep computer based register for each student. Students get a weekly paycheck and pay rent, fines, and taxes. They can use any extra money to purchase items from the class store or buy items from our quarterly auction. That is it in a nutshell. There is SO. MUCH. MORE to it, and it can be time consuming. But I love how it ties in the economy (which is in our standards) and math, and it is real-world based! Parents love it and the kids enjoy it too. I've decided that since I have only made a few tweeks over the years, and this past year we came across some issues, that the system needed an overhaul. It's taking me longer than I had hoped, especially because school is less than two weeks away, but I'm sure I'll get it all done! To start, I made this nice little job poster. In the past every job had the same pay rate, $20 per day. The bankers usually do a phenomenal job, and work more than anyone else, so I bumped them up to $30. I decided to have more of a pay scale this year. Not only did I want to better compensate for the harder jobs, but I wanted to encourage certain jobs and maybe make some jobs (like zoologist) less desirable. We'll see how it goes this year! Any economy suggestions out there? Yesterday I went in to school to start setting up. My fabulous sister joined me and we started to put contact paper on my tables. We'll head in tomorrow to finish up (as long as we can locate more contact paper!) and then I'll get to show off the finished loveliness. I would really love to do something like this one year. Your job names are cute! Thanks! 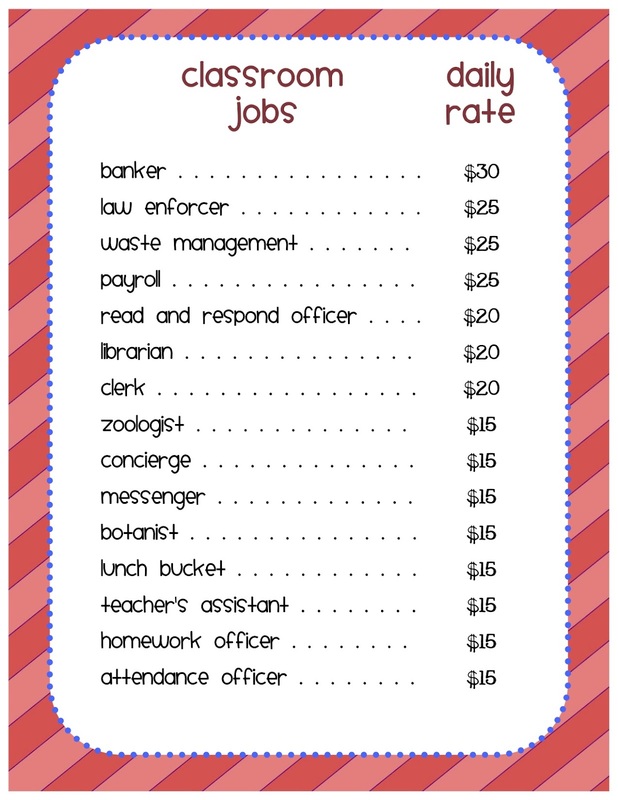 I highly recommend a classroom economy system. It can be daunting at first, but I have learned to make sure that it is mostly student run. Let me know if you are interested in more details or any forms/templates. Hi! I've just started following you, so I haven't had the time to fully stalk through your posts, but have you posted how you do your economy system in detail? I'm moving to 5th grade from 1st this year and would love to do something like this, but don't even know what all it entails :) Thanks!! Jacki, I'm planning on writing up my improved system as soon as I get it complete. Here are the condensed details that I have given to parents in the past (some of this is going to change). Let me know if you would like some of my forms that I have used, I'm happy to email them to you! There are 4 ways to earn money: coming to school on-time everyday, completing all of your homework each night, completing your agenda, and by fulfilling your job requirements. Students will earn $1.00 for everyday that they are in attendance and on-time. Another $1.00 can be earned by completing all of the homework assigned from the previous night and $1.00 for writing in your agenda every night. You will earn a weekly salary for your job of $100, if you have fulfilled all of the job requirements that week. On occasion students can earn bonus checks, at varying amounts for certain activities. At the end of each week earned money will be tallied and checks will be written and distributed to students. Students will have the opportunity to deposit their checks at the bank. Each student will be responsible for keeping their check register balanced. Students will receive a check register once they have met the requirements of the check math test. Each student will be charged rent fees for their desk ($120) and chairs ($60). Rent is due at the beginning of each month. Rent that is not paid on time will be assessed a late fee of $5.00 for every day late. Students cannot opt out of having a desk and chair. Students will add up the money they have earned and complete a W-2, itemize deductions, and file their tax return. Tax returns must be double checked by their tax advisors (parents) before filing. Tax returns must be filed with the teacher on or before April 15 in order to avoid a penalty (loss of recess). We will have a “store” approximately every 2 weeks during which students can spend money. We will also have quarterly auctions depending on amounts of donations from families. I rely on parent donations to make the auctions successful. There are many teachers who I borrowed ideas from. 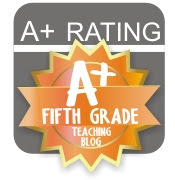 Most of the credit goes to Mrs. Renz, Mrs. Newingham, and Mrs. Gold. Love it! I do this too, but have always used physical bills. Is there a way you keep track of each students earnings to make sure their checkbook is correct? Or is that what the bankers do? How does that work? And do they write each person a check at the end of the week? I set up an Excel sheet for each student and the bankers enter all the deposits and payments on the spreadsheet. I started using Google Docs for this because multiple students can log on at the same time to one account, and only the bankers have the password. I check students bank accounts with their checkbook register once a quarter, although I really need to do that more often. Checking their accounts (and helping them find errors) is the most time consuming part of my set up. For students to get paid I have the floor supervisors who make sure that all the jobs are completed during the week and they report this to the payroll. These students write up the weekly checks, give them to me for a signature, and then hand them out.